Early results of a biopharmaceutical companies-based initiative to encourage access to treatment in developing countries shows a focus on cancer, diabetes, and cardiovascular disease, through 62 programmes. The report, conducted by an independent observatory, provides key findings on several areas, including local priorities, and social inequity. An independent review framework of an industry-led initiative to help with access to treatments in developing countries just issued its first results. 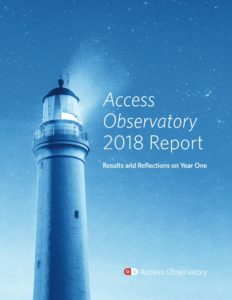 The Access Observatory‘s first report [pdf], provides early results of Access Accelerated activities. Launched in 2017, Access Accelerated is a collaboration of 23 research and development-based biopharmaceutical companies, in partnership with the World Bank and the Union of International Cancer Control. An independent “Access Observatory” was developed, a platform that aims to improve access to disease prevention and treatment services in low and middle-income countries. “The Access Observatory was started to address some of these challenges,” he said. The Access Observatory is a measurement framework and reporting platform developed by a team of researchers at Boston University School of Public Health to monitor and document the work of Access Accelerated, Galea’s foreword says. According to the report, the Access Observatory team designed and developed a “new measurement framework that serves as a common language for categorizing, understanding and comparing access programs.” The framework includes three main components: a taxonomy of 11 strategies describing common approaches used by access programmes, a series of logic models detailing the pathways by which programmes may achieve impact, and a set of clearly defined indicators for reporting programme activities and achievements. The measurement framework “was designed with independence from the pharmaceutical industry,” the report says. According to the report, 62 Access Accelerated programmes operating in 103 countries were registered in the Access Observatory since the launch of the Access Accelerated initiative. Most programmes were conducted in sub-Saharan Africa and Southeast Asia, it says. About two-thirds of programmes addressed cancer, the report says, followed by diabetes and cardiovascular disease. Those 62 programmes involved 198 partnerships between companies and other organisation, with two-thirds of programmes having “at least” one public sector partner, and over half of the programmes aimed to address income-related inequity, the report says. The Access Observatory provides a number of key findings. For example it found that a large number of programmes included health worker training activities, programmes targeted a wide range of beneficiary populations, around one-third of programmes provided at least one health technology, including medicines, vaccines, and diagnostic equipment, most medicines are used to treat or prevent cancer, and were provided via a price scheme. The report also says that partners of programmes represented a wide spectrum of the public sector, private sector and voluntary sector, and a majority of programmes engaged with the government as a local stakeholder. On inequity, the Access Observatory found that more than half of programs aimed to address income-related inequity, and that more information is needed for local stakeholders to understand how programs are adequately designed for the context in which they are implemented. Is it possible that in the future there maybe a Pharma-Led Initiative to combat Tuberculosis where this highly contagious infection is frequently lethal.